If you think that one political party has done 'Banta Dhaar' and other is doing 'Sudhaar' than you are totally mistaken. They are the birds of a feather flocking together. Ab Kya Ho Gaya? You all must be thinking. The two big political parties of India namely Congress (I) and Bhartiya Janata Party (BJP) become one cleverly to dilute the Foreign Contribution (regulation) Act , 2010 which restrict and regulate foreign contributions to any political party. In May 2014, the Delhi HC directed the government and the EC to take action against the BJP and Congress based on a PIL filed by the Association of Democratic Rights for accepting the donation from London based Vedanta Group. Both the parties moved to the Supreme Court to challenge this order and before Supreme Court could issue any statement regarding this the FCRA was tweaked down in the Parliament to favor both of parties. Gaye Bhains Paani Mein. The amendment made to the FCRA act changed the definition of foreign company to make these donations legal in the law. Neither the ruling party nor the largest opposition party have no objection on the issue ; it is not even discussed by them in Parliament and on public platforms. They are 'Ek Thali Ke Chatte-Batte' on such issues. Now they have removed their appeals from the Supreme Court because they knew that law has become favorable to them. Moreover the amendment made in 2015-16 is applicable from the date of passing of law in the year 2010 gazab. Allowing foreign donations will result in making and enacting laws which will be beneficial to these corporate firms. I want to ask why these parties need such huge contributions when there is a limit set to spending on elections by the Election Commission. 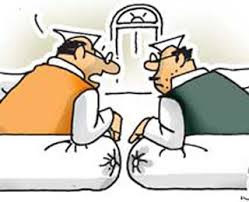 Hathi Ke Daant Khane Ke Aur Dikhane Ke Aur they all are sitting on similar sides as far as corruption is concerned. The people today are standing in queues patiently only in the hope that Achche Din will come but the intention of political parties and the impact of their policies talking in different directions. Neither the terrorism, nor the fake currency or black money has stopped from demonetization which I considered as the failure of this scheme and government should think to roll back it soon. Kahan Se Kahan Chala Gaya it is not the deviation from the topic but the part of the topic since these parties specially the ruling party under Narender Modi is speaking frequently about the corruption in the country and that every Indian should come clean out of it but when ball falls in their own court they become silent. We common people are fighting with each other on the pros and cons of demonetization to prove our alliance to the honesty and betterment of the country while our politicians are busy in washing away their sins together. Ram Teri Ganga Maili Ho Gaye Papiyon Ke Paap Dhote Dhote. Ye To Aise Hi Chalega unless we started question the people in authority. We have to realize the power of the questions and avoid flowing with the tide. Hum Sab Ek Hain should be our motto not only against other nations but also against the evils of our own society. Khayenge Aur Khane Denge we have to stop them from doing so. God Bless India. Yes, the citizens are still to wake up in spite of all the yokes imposed on them!